While working on my health history post for the new health blog JJ and I are making, I looked back at some of my older blogs to see if I had written anything of use -- I had! And I'm so thankful that my past self took the time to document what was happening with my health. I have been blogging since 2005, so there's a lot out there. It's just not out there for the public. While looking in one of my more recent blogs, from 2009-11, I found some good advice. So I'm going to start republishing some posts here, written by a younger me. The first is about taking risks/chances, written when I had just been greatly rewarded for doing so myself. And tomorrow I'm off to Thailand for some sun and heat. I am so excited for the weather and food, I don't care what I'm doing there. I'll be back on February 1. Until then, have the happiest of birthdays JJ and Chad! 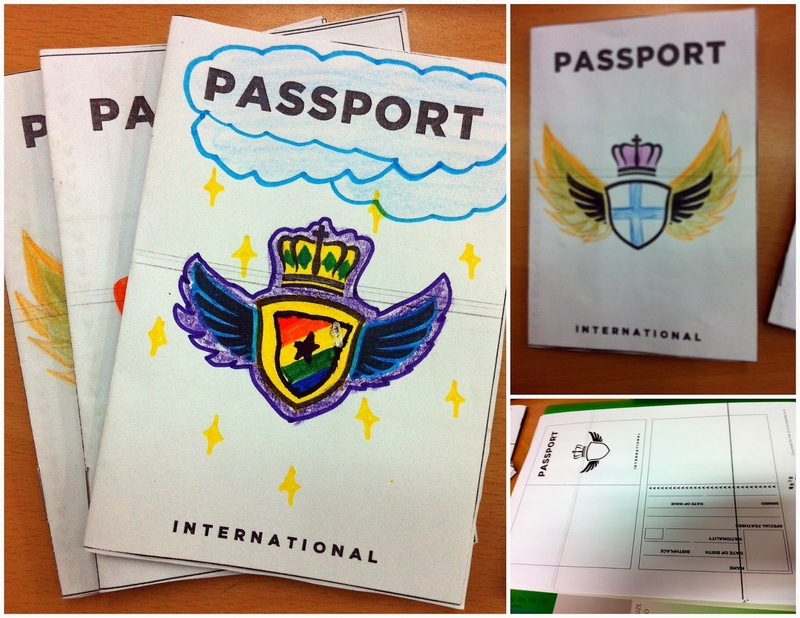 I wanted to briefly share here how I made the passport stamp template for my students' international passports from English winter camp (the same camp which is available for purchase below). It took a decent amount of searching on the internet before I found something that would work, so hopefully this can save other people some time. 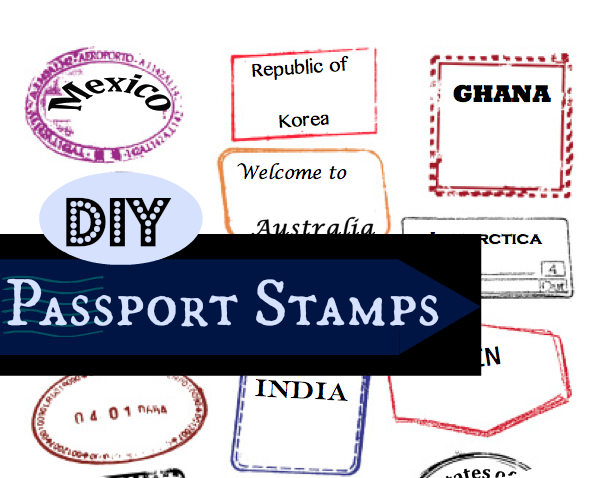 I used a photo of blank passport stamps from istock and resized it in Microsoft Word to half the size of an A4 paper. Then I inserted various text boxes and word art to write the country's name in 10 of the stamps, while leaving room for a date stamp. Since I only needed ten stamps, it didn't matter that the middle of the photo was covered in an "istock" watermark; I simply didn't use those stamps. Also, since mine would only be printed in black and white, I didn't change the font color. If you print these in color, you could make them look a lot better by playing with font colors. 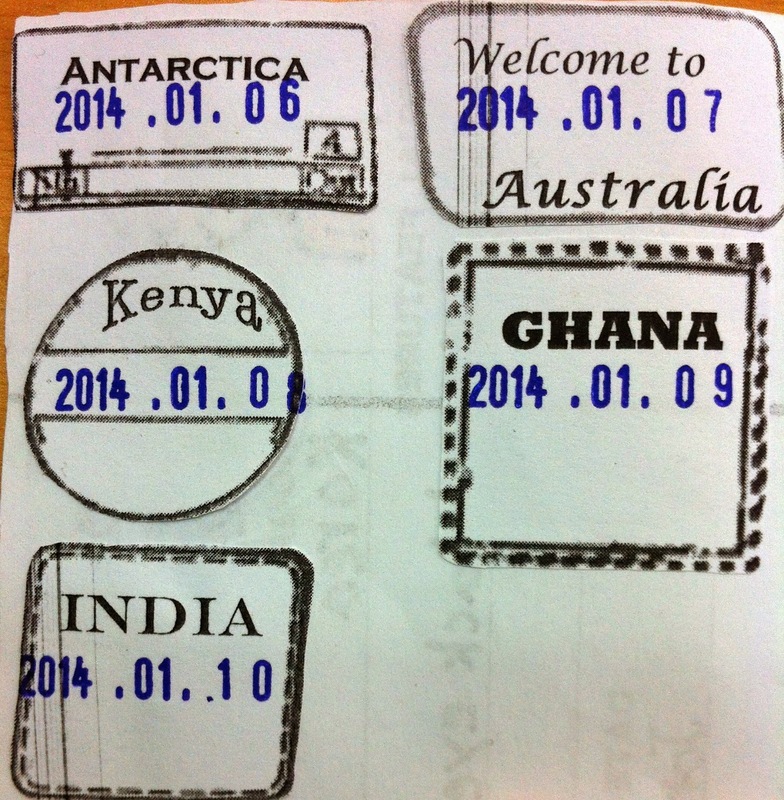 Here's a word document of the editable passport stamps. And here's where you can download the blank passport templates I used (black and white) for the kids. 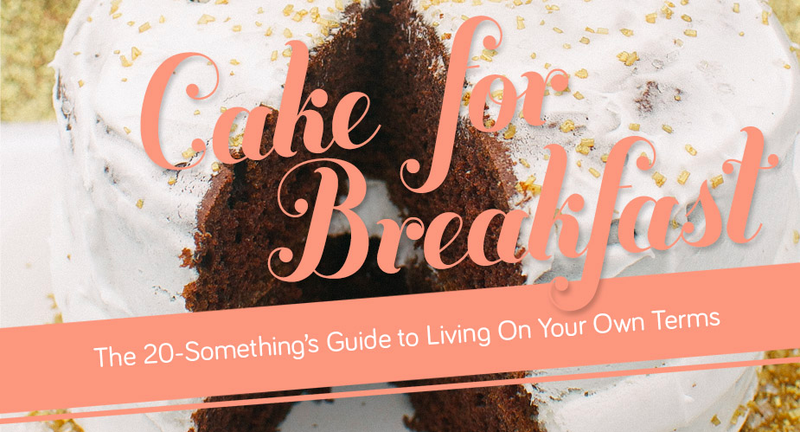 In December I received the opportunity (via 20SB) to review a complimentary copy of Cake for Breakfast, a self-guided course created by Ashley Wilhite of Your Super Awesome Life. Why was I interested in the course? Graduating from college in 2011 wasn't that scary because I quickly lined up a 9-month gig: going back to Spain for a second year - this time teaching English. The scary moment came at the end of those nine months, when I had every possibility staring me in the face. Do I stay in Spain for another year? Travel Europe? Move to France? Return home? Au pair? Go to grad school? I had many sleepless nights that summer in Madrid, thinking about which open door I should walk through next. Ultimately, I returned home that fall (2012) to pay back my student loans at a faster pace while working at a 9-5. 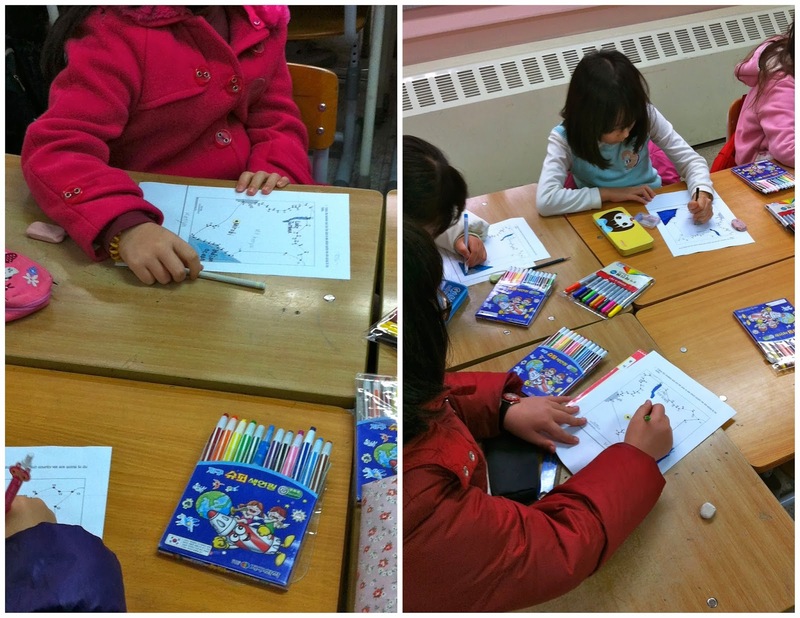 By spring I had quickly lined up another yearlong gig: teaching English in South Korea. I still have over half a year to go on my contract here, but my school loans will no longer be a limiting factor when I decide what to do next. So it truly is an open slate. Which is why I was particularly interested in Cake for Breakfast at this moment in my life. I knew what my values were, and I wasn't afraid to go against the grain on my next pursuit, but I had no idea what that next pursuit would be. I didn't print out the workbook in order to save paper, though I don't even own a printer here in Korea had I wanted to. Instead, I used the free notebook I got from our trip to the Korean National Museum in September. I was happy to finally put it to good use, and to keep all of my Cake for Breakfast stuff in one place (there's even room for the weekly journal entries I'll be making for the next year). I made my way through the workbook in about 10 different sessions over the course of a month. Each session was anywhere from a half an hour to an hour (+) long. The first two sections of the workbook helped to affirm what's important to me: education (learning and teaching), travel, helping others, and self-improvement. It also provided a place where I could concentrate on recent influences that told me to focus on my health. I connected the dots and realized that before I could think about my next step, I had to first look out for myself and finally tackle my longtime digestive problem head on. The timing of the course was key, as I used findings from the first two workbook sections to create my 2014 resolutions. I was less engaged during the third and final section of the workbook, but I have a few ideas as to why. Using everything I'd done in the first two sections, we were to first list our top five "priorities", things that were important to us. So I listed five things that were important to me. They were big categories, basically the five I just listed above. The next exercise asked us to list a step we could take towards each of the five priorities. And that is where I really got tripped up. My priorities were vague: educating/teaching others, learning/self-improvement, and health, for example. How could I list a step that would make education more of a priority? Shouldn't I get a few concrete goals first, and then figure out small steps to reach those goals? I know the best way to make changes is if the goals are as specific as possible: "Finish the Coursera Nutritional MOOC in three months" or "Reach level 10 in Duolingo's French by such and such a date", for example. But if the aim is to make "learning" become a bigger priority in my life? It was too vast for me. I really got stuck on the wording, and my non-abstract brain could not get past it. I wanted to lay out a plan from a to z. Where exactly did I want to be, and how would I get there. However, the task was to make values gain importance in my life, which wasn't clear/concrete enough for me. The other reason I had trouble finishing the third section was because at this point I had already put together my 2014 resolutions, so I wanted to focus on breaking down those three areas into small, attainable tasks rather than messing around with these five priorities. So my reasons were clearly personal - unique to my life and brain. I wasn't disappointed though, since I was already satisfied with the first two sections alone. And not all was lost in the third section; I took away a new idea I'll share below. (+) Product appearance is important, and Cake for Breakfast passes with flying colors; the design and layout of the workbook are great. It's clean, appealing, professional yet fun, and boy does that cake look delicious. The color coding of the three main sections was much appreciated, as I'm a visual learner. 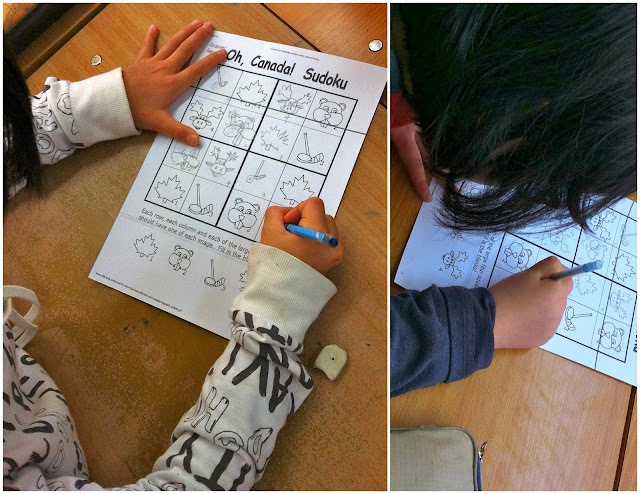 (+) Of the exercises, I really liked the 100 questions activity. I'd never seen it before, and although it took about an hour to complete, the exercise was fun and helped me analyze and pursue my thoughts that don't always get observed. (+) I mentioned above that I took away a new idea from the final section of the workbook. Normally with resolutions or projects, I like to map them out from start to finish. How am I going to get from a to b in this time period? Where do I need to be each week in order to finish by the due date? I must see how it will fit in the given time period. But Ashley suggested a method I had never considered. First you write a task that can be easily completed, and give yourself a deadline (no more than a few days out, because the task should be easy, no?). After it's completed you figure out the next step, and give yourself a new deadline. So you're working step by step without having the big picture first. It really goes against how I normally function, but I'm giving it a try with my resolutions this year, since I cannot possibly map them out from start to finish due to their nature. What I learn along the way through research will shape their paths. I wouldn't have considered going this route had I not read it in Ashley's course, so again, it was great timing with the new year. ( ) One of the audio files (I believe it was the second) didn't have uniform volume throughout. So all of a sudden it was really quiet and I had to crank the volume, then later on it was back to normal, so I had to turn it back down. The music in one section was scratchy, too -- but nothing that can't be fixed! ( ) Since I did the course in many sessions and on different computers (sometimes at home, sometimes at school), I'd have to find my spot in the audio again each time. It only took a minute, and yes, I could have jotted down the timestamp in my notebook at the end of my previous session, but I didn't always remember to do so. My suggestion would be to add timestamps to the workbook. Not so many that it becomes obnoxious, but maybe at either the top or bottom of each page or at the start of each exercise. As a self-help junkie and introvert who is all for following your passions, I spend decent amounts of time with my thoughts through journaling, blogging, reading certain books/blogs, and hanging out by myself. And I benefited from this course. So for someone who has never really taken the time to reflect on these questions about what you want in your life, or someone who has unknowingly gotten stuck in a busy life that keeps flying by, I can only imagine the impact the course could have. It provides you with a place to consider and ask yourself important questions about your values and the life you want to live, plus the structure & encouragement to make those plans a reality. And although it's called the 20-something's guide, I don't think you necessarily need to be a 20-something in order to benefit from Cake for Breakfast. Note that the course does seem to be geared towards ladies. Ok, so how can you get your hands on this self-discovery course? Cake for Breakfast can be purchased here at Your Super Awesome Life for $97. Keep in mind it can also be given as a gift. Pick up Quarters - Wear rubber dish-washing gloves and move quarters from one tub of water to another, while being timed. I'm glad I used Crocodile Moray after first thinking of the game back in November. I didn't change the lyrics, so it didn't really teach them any English... but they had fun playing! I've seen "moray/morey" spelled both ways on the internet. I do realize my photo uses "ey" while I used "ay" for all other instances. After playing Crocodile Moray I started the puppy chow to make sure we finished that. There was no time for "I've Been to Harlem," so we're going to play it on Friday because I really want to do the activity with these kids. My sister suggested the activity back when I was brainstorming -- thank you! The children were thrilled to be making something chocolate that they could then eat. I think puppy chow was a great treat to make in class because it was interactive. Each student got to put one cup of cereal in the bowl, since I had nine students in the first class and ten in the second. Everyone also got to stir the chocolate chips/peanut butter/butter mix after it was microwaved. 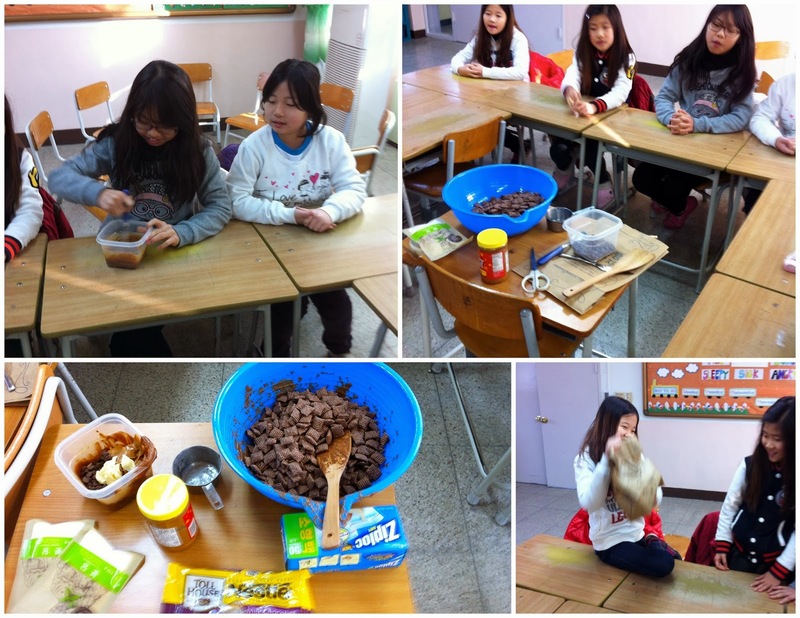 And lastly, all students took a turn shaking the paper bag of powdered sugar and the cereal mix. 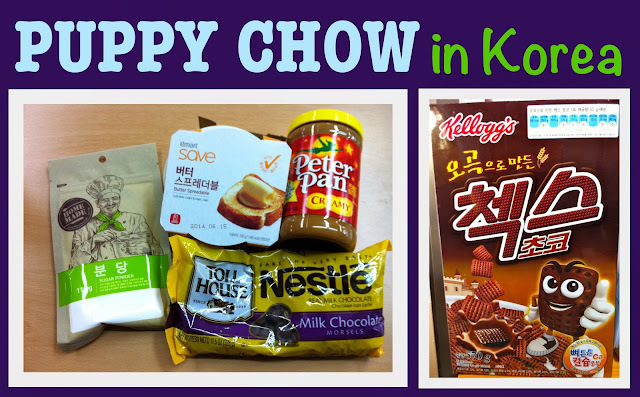 Notes: If you want to find puppy chow ingredients in Korea, here are my experiences. I didn't see Chex cereal anywhere, so I got a Korean brand of chocolate cereal that's kind of in the Chex shape. It worked - a picture is below. Peanut butter you can find in most grocery stores or in Paris Baguette. I did all of my shopping at Emart - they have it there. I ordered the chocolate chips on iherb with a personal order because I didn't want to hunt for a substitute. I almost couldn't find powdered sugar in Emart, but did. It's just not next to the sugar as you would think. It was in a different aisle, next to brownie mixes / flours. It's called "Sugar powder", and a it's also pictured below. I bought three bags since they were small. Two and a half bags of this powdered sugar were enough for two batches of puppy chow. The warm up didn't go over too well -- I won't use it again with EFL speakers at this age/level. 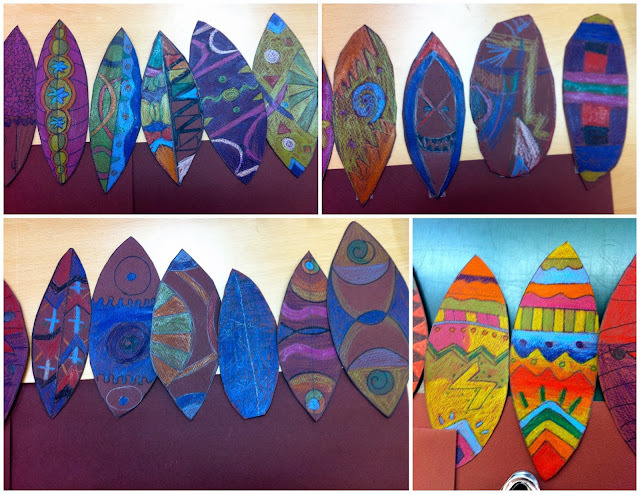 We did the Canadian sudoku, and both classes spent the rest of the time making two feathers for the Native American headdress, and finishing up their kente cloths from last week. No one potato, two potato nor symbols games. Note: A highlight of the day was when four boys from the second class started playing "Crocodile Moray" with each other during the five minutes before class started! I only played "Fisty fist" with the second class. It was brief and kind of pointless, but they liked it. 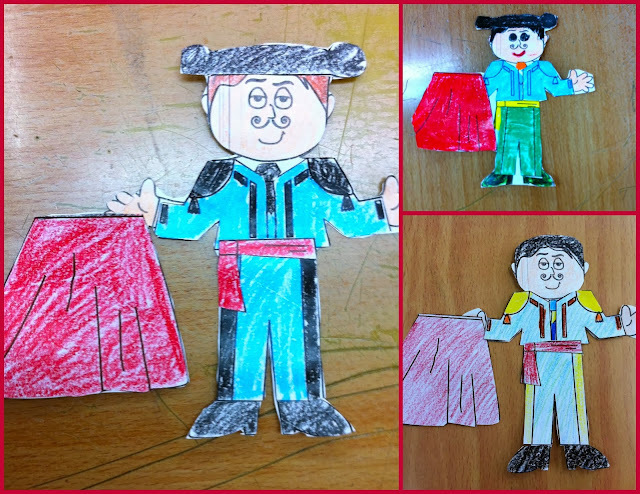 And the rest of class was spent making these Spanish toreros: bullfighters. You can't really tell from the below photos, but it's a cut-out doll, so they had to cut out all of the clothes, shoes, hat, belt, etc. and glue them on the man. The warm-up was another miss. It was hard to get any students out, and they all looked so bored. I did have harder words for the older class: shirt, shoes, and skirt. Right at the start, one boy couldn't tell if I said "shirt" or "short", so I decided to make their three words "shirt, shoes short, and skirt" instead. It became trickier than it had been for the first class, and now I had a new idea for teaching minimal pairs (perhaps with my after school Special English Class next semester). We quickly voted on students' favorite games/activities from the past two weeks. Student favorites were "Human knot" and "Crocodile Moray", with the penguin relay and Macarena coming in third and fourth. We would play these tomorrow. After singing the M-E-X-I-C-O song (to the tune of B-I-N-G-O) the kids started making their sundials. My first class of younger students did not want to make them. "Please, no, teacher," they said, "Game, game." Whoops. Not enough movement today I guess (though they were standing and moving for my failed warm-up!). But tomorrow would be a day of games, so I somehow got them to start coloring. 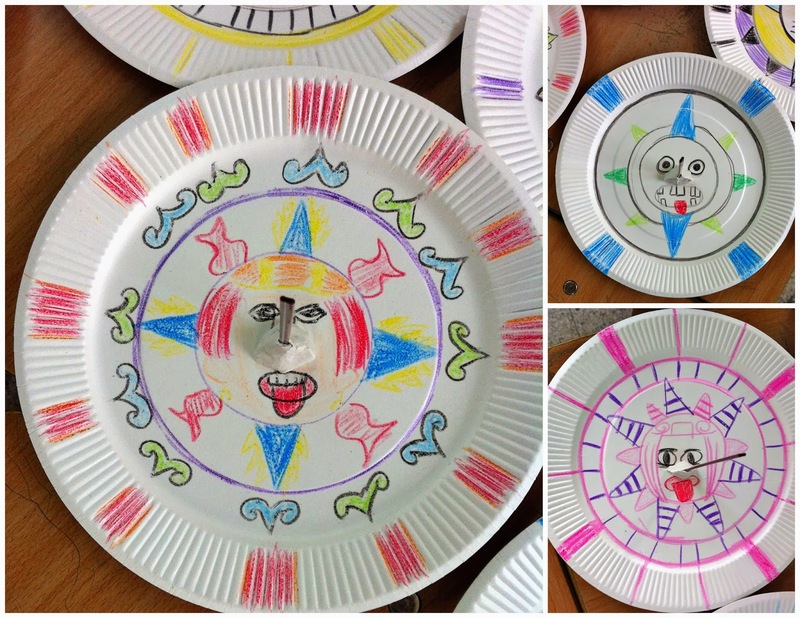 During my second class, the kids started making the sundials without any resistance; it's interesting how moods change from class to class, day to day. Day 10 - Review/Last day! Pass back feathers from Native American headdress, glue on Korea passport stamp, pass back Aztec sundials, etc. I wanted to make the fortune tellers we never had time for last week, but there was no time today either. Oh well, I'll just have to find a way to incorporate that into my summer camp! Cup passing game held their attention -- some wanted to play longer, but then they realized we had yet to play the other games, and time was limited. 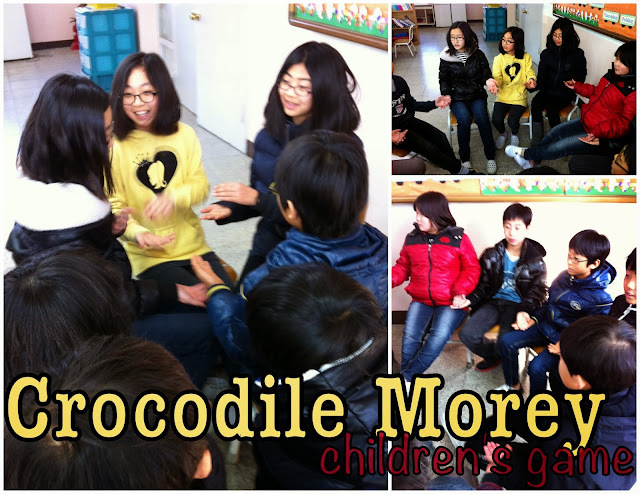 My second class barely had time to play Crocodile Moray. I had them quick play in their desk groups during the last two minutes. One of the boys in my first class didn't have his passport after I'd passed them all out today for stamps. The kids have been turning in their passports at the end of class every day of camp. I clip them together and put the passports in the desk, and take them out the next morning when it's time for stamps again. I have no idea how on the very last day his was missing. I felt bad and did some looking (under the desk, in the recycling bin, in my camp binder) but it didn't turn up. Luckily, he was one of two boys in class and didn't seem all that disappointed. (Had it been me in third grade, I would have been upset and wanted a replacement at the very least!). The whereabouts of his passport still puzzles me because I'm quite systematic and routine. Oh well, it's all done with now. It's been a long journey from the day in November that I got details about this "winter camp" I would be teaching: through all the hours of planning -- both at school and at home, at nights and on the weekends -- to the actual camp, and now the end of the last class. Only six more months until summer camp! I'm thankful for all of the quiet, alone time I've had thus far at school during winter break -- this "desk warming" time is awesome! Our contract already gives us 20 vacation days to take during the year, which adds up to four full weeks. That's pretty good for a full time job, eh? Nearly on par with the Europeans. So of the remaining 11 months of work, if some of those days are spent in an empty school without classes to constantly plan for and teach, I'm all for it. I'm so at ease and relaxed working in the office alone, with no one looking over my shoulder. I'm able to get a lot done: reading, blogging, learning coding, planning lessons for next semester, etc. When March rolls around I'll surely be looking back longingly at these days. It was well over a year ago now that I first stopped using shampoo. I did so after learning about the no shampoo "movement" from Missris via her no shampoo progress update post in October of 2012. It has been said that since shampoo strips the scalp of sebum (natural oils), the body over produces oil to compensate for the loss. So no shampoo will actually make your skull less oily. Not using shampoo also helps to reduce pollution, both plastic and chemical - but that's not why I made the switch. Rather, it was a simple habit I could change in order to live more naturally. Other changes I made at the same time included making and using homemade 2-ingredient deodorant and brushing my teeth with natural, fluoride-free toothpaste (So glad I'll never see you again, Crest!). So after tapering off regular shampoo, I replaced it completely with baking soda and apple vinegar. 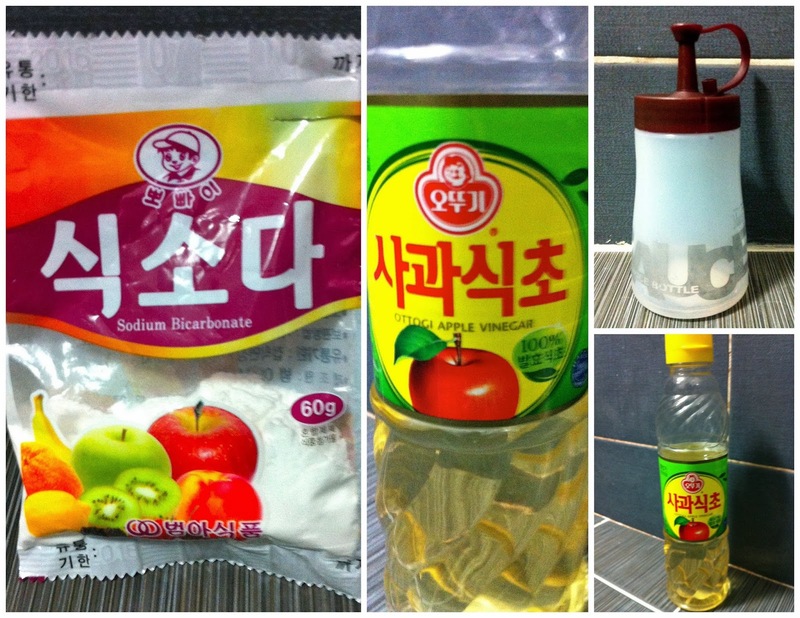 You mix each with some water, the baking soda + water being your shampoo, while the apple vinegar + water becomes your conditioner This worked well for me; vinegar makes your hair so smooth! I continued the new washing procedure until I moved to Korea this fall. To avoid needing to hunt down baking soda and apple vinegar in a foreign land before I could have clean hair, I bought a big bottle of 2-in-1 shampoo & conditioner and brought it along in my luggage. A few weeks ago at the grocery store I saw a little baggie of "sodium bicarbonate" on the shelf. So I spontaneously bought a pack, then went off to look for apple vinegar, which I found and purchased. Later on in the other grocery store I got a cute little sauce container for under $1; it works perfectly for this type of hair washing. I started the transition during my winter break, since I'd see less people. It does take some time for your skull to adjust, so hair appears greasier at the start. Rather than tapering off my shampoo use this time, I just completely stopped and switched over to the baking soda and vinegar right away. I wasn't showering/shampooing every day to begin with. Nor every other day, hah. So far I notice that my hair is a lot softer than before. It's also notably less oily, this being the third full week without shampoo. Have you ever washed your hair with baking soda and vinegar? Have you heard of the no shampoo "movement" before, or was this the first time? To celebrate Anne's birthday coming up on Tuesday, we had pizza tonight at Pizza Peel in Itaewon. 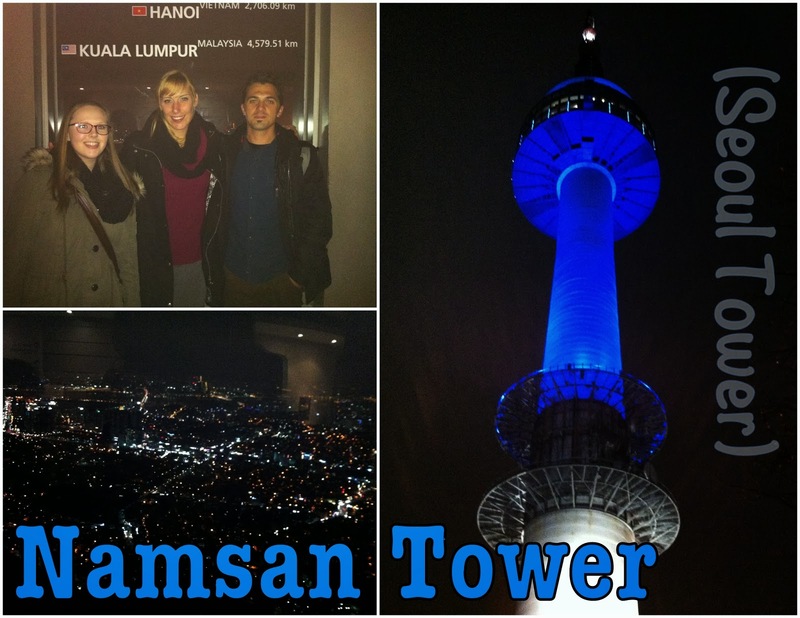 That was the only plan we had, so I was delighted when it was suggested we go to Namsan Tower (N Seoul Tower) afterwards. Visiting this landmark has been on my Seoul to-do list since September, so it was exciting to finally go up. (My Seoul "list", by the way, still exists solely in my head, but it'll get written and posted soon since it's one of my time-sensitive 2014 resolutions). 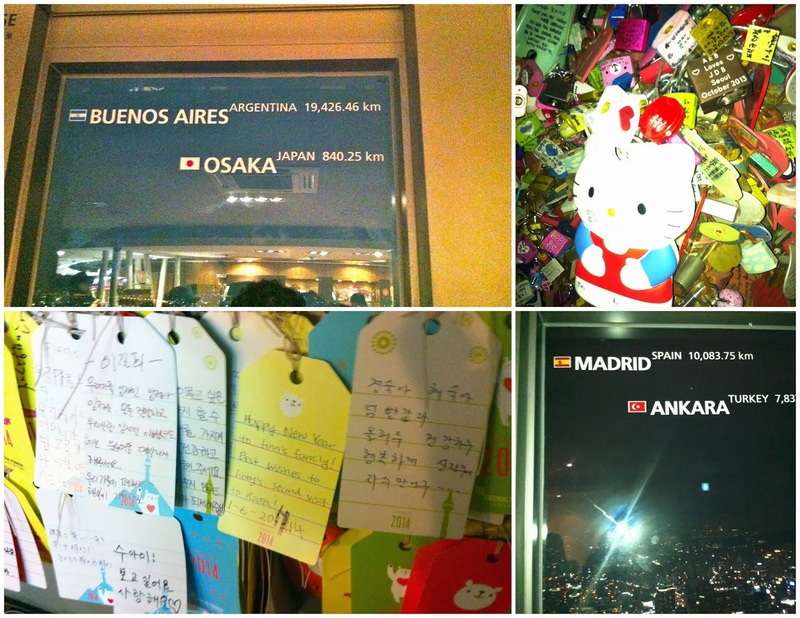 We took a bus (#03) from Itaewon (just outside of metro Exit 4) directly to Seoul Tower. You can easily see this landmark from all over the city due to its height, but what I failed to realize is that the tower itself isn't that tall. It just sits on a massive hill in the middle of Seoul. I had it in my head that the only way to get to the tower was via cable cars, but our bus drove up this hill to the very base of the tower. There were amazing city views even from the bus windows on our way up! 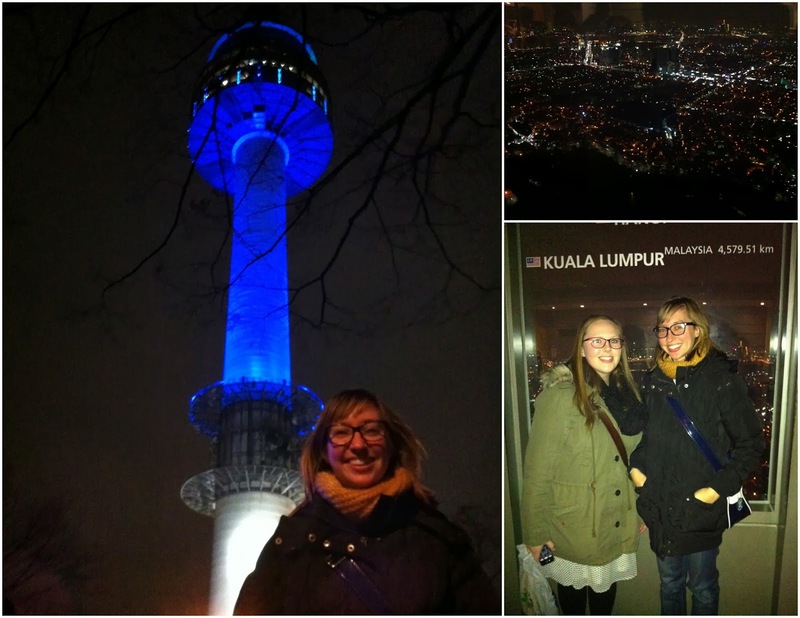 We took a few pictures on the ground below the tower before getting tickets to go up. Our ticket numbers wouldn't be called for a half hour, but it was the perfect amount of time to browse the gift shop and look at the love lock "trees" outside. It was a very brief elevator ride up to the observatory deck. Each window displayed 2 - 3 city names and their distances from Seoul. We thought that it was probably best to come at night; Seoul couldn't look too amazing during the day with all of the grey buildings and cars, could it? There was also a little red post box on the observation deck, with overpriced postcards for purchase nearby. I saw the words "highest post office" printed on a nearby window and quickly took that to mean this was the highest post office in the world! Anne and I each bought a postcard, which we addressed, stamped, and mailed from the tower. (Stamps were included with the postcards, and extra postage is readily available for purchase if you're sending it internationally). It wasn't until just now, looking at my photos closer, that I clearly see "Seoul's highest post office" on that window. Wikipedia tells me that the world's highest post office is 15,500 feet off the ground in Hikkim, Himachal Pradesh, India (4,700 m) (postal code 172114). 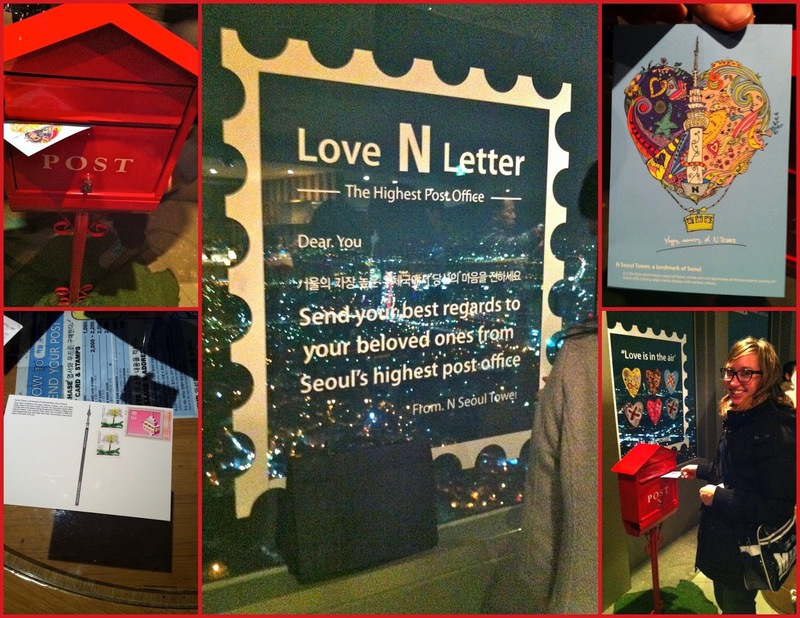 Oh well, still neat, although "highest post office in Seoul" isn't nearly as cool as the highest in the world. It'll have to do for now. This now concludes the first week of my elementary English winter camp. If you recall, I spent way, way too much time preparing for this. Like, ridiculous amounts of time. Browsing the web for really great activities, making the PowerPoints, shopping for supplies, etc. Most of my time was spent on step one though, the planning and looking for activities/games to do. (And I'm still spending time on the camps this week and next, making sample art projects in the afternoons for the next day's lesson). I over-planned each lesson on purpose because I never wanted to finish all of our activities with extra time staring me in the face. What I didn't realize is that I also grossly underestimated the amount of time each activity would take. Well, sometimes I underestimated on purpose, but I guess I didn't realize the extent. So here's a summary of what I planned to do this first week, and what we actually did. Note: Every day begins with a warm up, and then singing "It's a Small World". The last 5-10 minutes of every class are for cutting out passport stamps and gluing them into passports. Then students get the date stamp from me. Continents: Learn the continents with The Continent Song, and then play a fly-swatter game with the world map. Penguin Relay: Put a squishy die between your knees and walk (like a penguin) about four yards, around a chair, and back to your team. Then hand the die off to the next student. Each team is timed, fastest team wins. We didn't have time for the penguin relay or to glue on passport stamps, so I decided we could push both those activities to Tuesday. 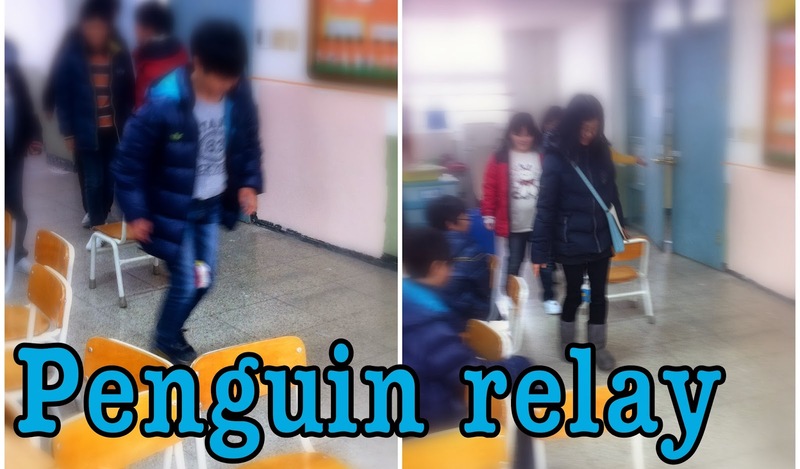 We began class with the penguin relay from yesterday, which the kids liked. I skipped "Skippyroo Kangaroo" for a few reasons: we were doing the penguin relay game, the floor is too cold/dirty to sit on, and I'm not sure if everyone knows each other's names. If they didn't know names, there wasn't enough time to learn names and then play. 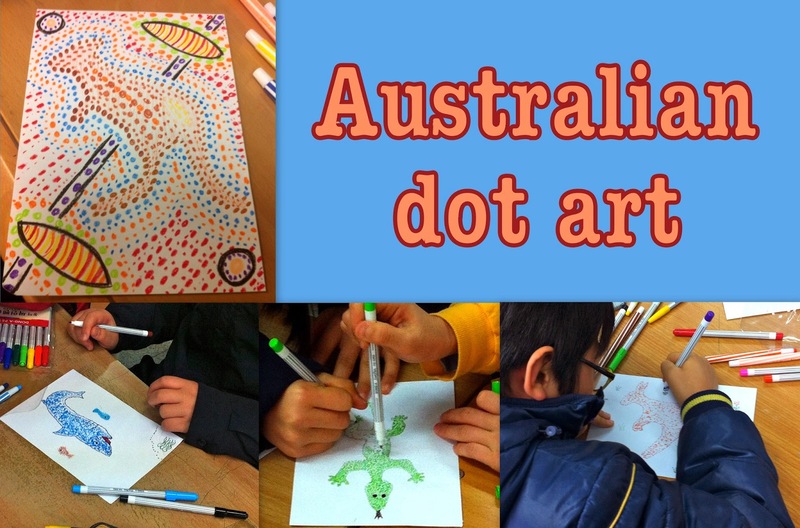 Since the department store I went to did not have green or yellow construction paper the night I had to do camp supply shopping (with the school credit card), I changed the activity to making Australian dot art. We only needed plain white paper and markers/crayons. 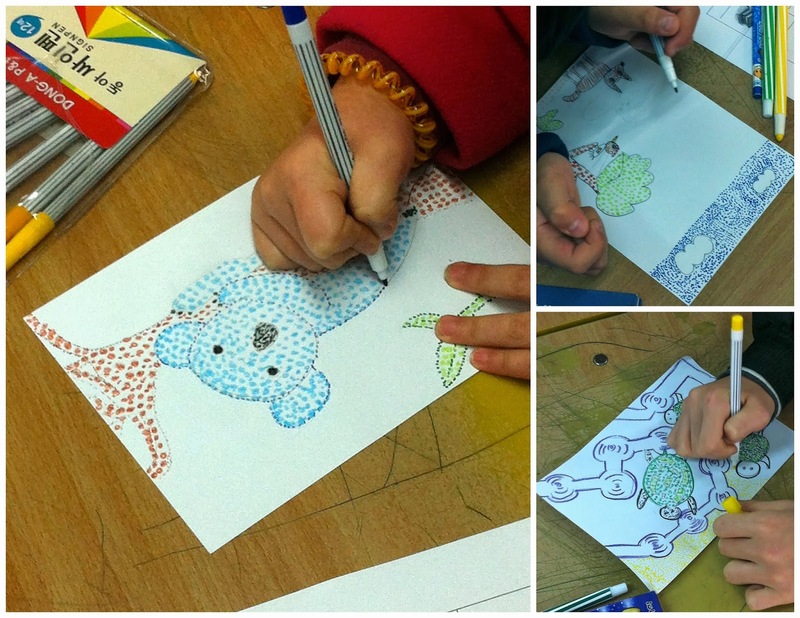 There was no time for Look, Go, Create; hardly anyone finished their Australian dot art. I'm glad I included Let Me See Your Funky Chicken. The younger kids were wondering what the heck was going on, why was their teacher doing these crazy actions, but they caught on. Some of the older girls were very hesitant to join in on the actions, while the boys really got into it. The map labeling took longer than I'd planned, which was good because I thought my last two activities were weak to begin with. So we didn't get to play Sparkle or Charades. Notes: The kids were really into the "Day in the Life" game I'd made, which I was pleased about. When I first found the Time For Kids page with daily schedules of kids from various countries, I knew I wanted to use the material but I wasn't sure how. Do I make it a matching game, where kids match the time to the activity? Or do I show the activity and they guess the time? Could the kids act out / role play a day? And then the week before camp started, the idea came to me to turn parts of the boy's day into questions with possible answers. It's interactive, fun, and they're learning about daily life in Kenya -- from a child's point of view. Obiswana: Sing the Obiswana song and pass music sticks on the beat, as demonstrated in this video by Dr. Nicola Mason. Then, use paper cups and a paper ball to play this Obiswana cup game. 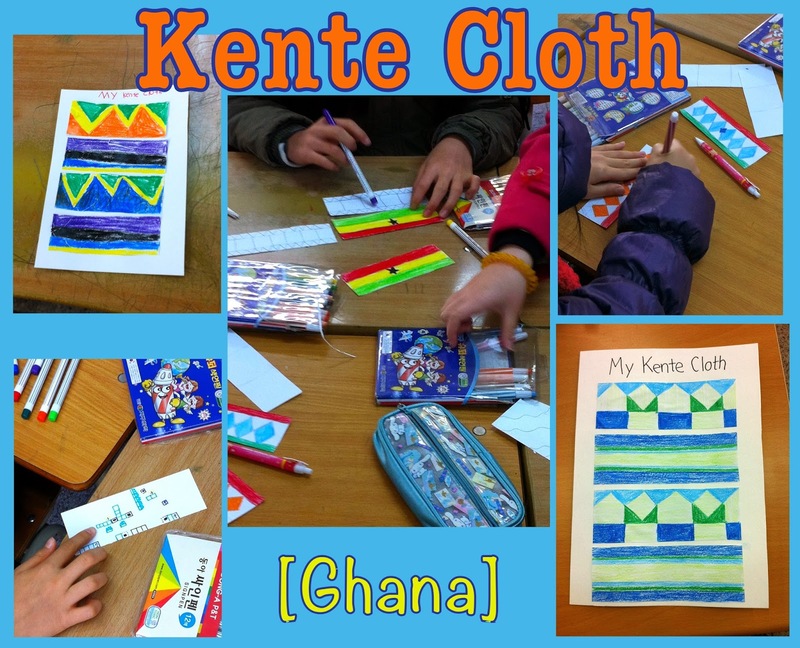 Kente Cloth: Learn about kente cloths, then make a paper kente cloth with four strips, two alternating designs. Ampe: Teach and play the traditional jumping ampe game that kids play in Ghana. To avoid sitting on the cold tile floor, I made a long group of 4 x 2 desks, with chairs on both of the short ends. This worked for our purposes. I could not find music sticks in the music room, but I did see a basket of yunnori sticks -- so we used those! The kids are singing too, I'm just too close to the mic! ^^ The volume cuts out for whatever reason near the end, but there's a paper ball under one of the cups. One student has his/her eyes closed until I say stop, and then they guess which cup has the paper ball. Obiswana took more than my estimated 15 minutes, and in both classes we only had about a half an hour to work on the Kente cloths (which was not enough time for most students). I collected the unfinished strips from my 3rd/4th graders so they can work on them a little bit tomorrow. During the chaos of clean-up and passport stamps, I forgot to collect unfinished Kente cloth strips from the 5th/6th graders, so I'm not sure what will happen to those. There was no time for the ampe game, but if you have a few minutes to spare I encourage you to watch Short and Tight to see what this ampe game from Ghana is all about. Notes: "I spy..." is a simple kids game that I think many Americans are familiar with. ("I spy with my little eye something that's the color ~." -or- "... something that starts with the letter ~.") These kids didn't know the game, so I liked that they were entertained and learned something new when all I had to do was share a game from my childhood. 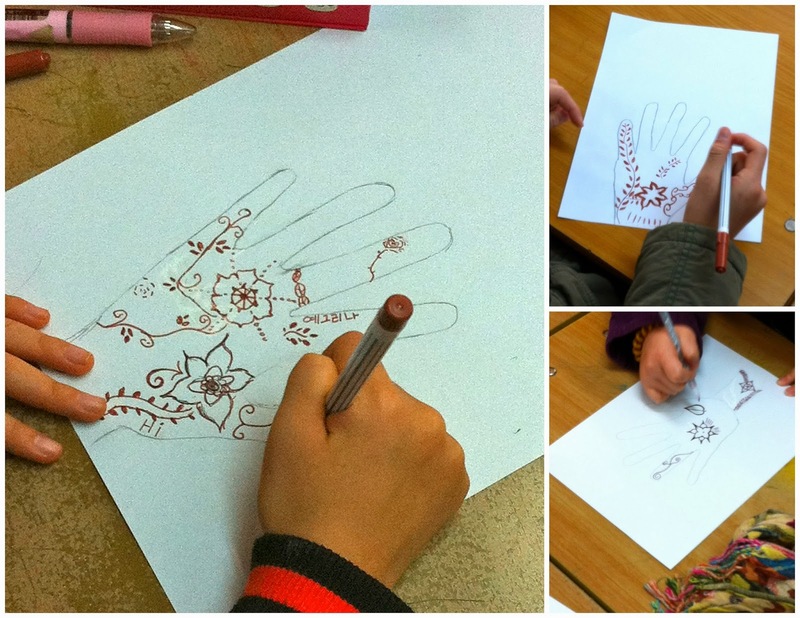 On Wednesday I knew that there was no way we'd have time for both art projects on Friday (henna hands and the fortune teller). I decided to leave off Japan, and we could always make the fortune tellers on the last day of camp, since that's still unplanned (it'll be a review game and/or doing the students' favorite games/activities again). So we began with the human knot -- both classes loved this. Both classes were shouting at me "One more time! One more time!" after they successfully untied their first human knot. So I let them play it again. I think I'll let them play this again next Friday, on the last day. The first class didn't have time for pictionary, but the second class did. Taking note of how long it took them to do other art projects during the week, I only instructed the kids to trace one hand for the henna art. I hadn't made a sample ahead of time, but I worked on one a little bit during each class (I was getting bored standing around). I like to play music while the kids work. 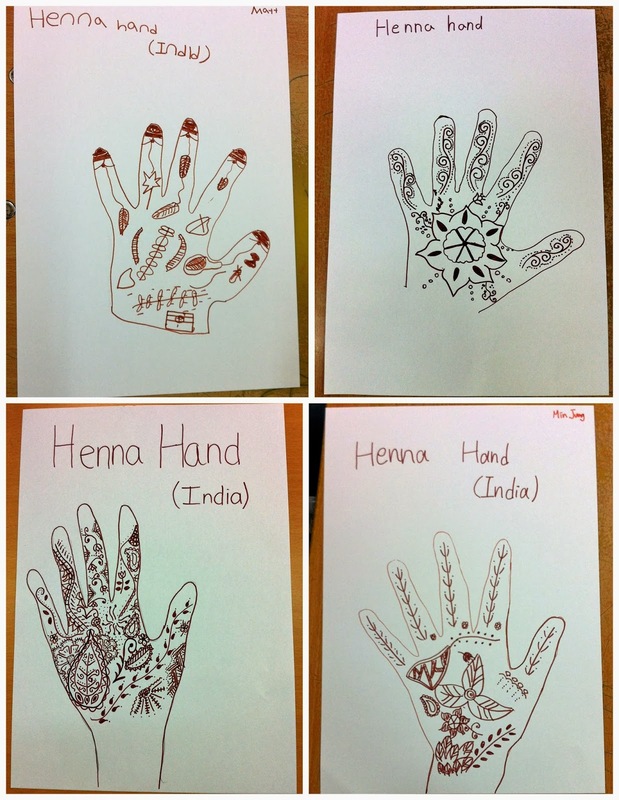 So we listened to The Best Hindi songs on repeat while they made their henna hands. In both classes, some students imitated the singer after they'd heard the songs a few times. 5th/6th grade henna hands -- guess which one's mine! Note: I was also a little nervous to feature Japan in the first place (but really wanted to make fortune tellers!). When the country came up in my after school Special English Class earlier this fall, there was clearly negative talk going on. Not playful jabs, like the U.S. does to Canada, but a strong dislike with a hint of anger. And these are 5th/6th graders! Yesterday while leaving school I saw three students of mine (4th grade boys) walking past with a small dog. We said hello, and then I asked if I could pet the dog. My personal preference is for bigger dogs, but that was the first dog I've had the chance to greet since arriving in September. And it was so incredibly soft! I told the boy his dog was very "cute," a word he would understand. I could have stayed, squatting, petting that dog all afternoon! But the boys were obviously on their way somewhere, and who wants to be around their English teacher on winter break? So it was a brief encounter, but those 20-seconds really brightened my day. I'm thankful that our paths crossed, and that the boys were nice enough to stop and say hello. And especially thankful they were accompanied by the dog! I read PostSecret every Sunday, and today I was surprised (and excited) to see one in Korean. The best part? I could read it! It means "Sorry...". I learned the word in the fall at a badminton practice after school. During one game the funny, talkative third grade teacher from my school made me say sorry to him (when we were partners) every time I messed up. It was all in good fun, and I learned a word! (Since I had to say it so much! Hah). 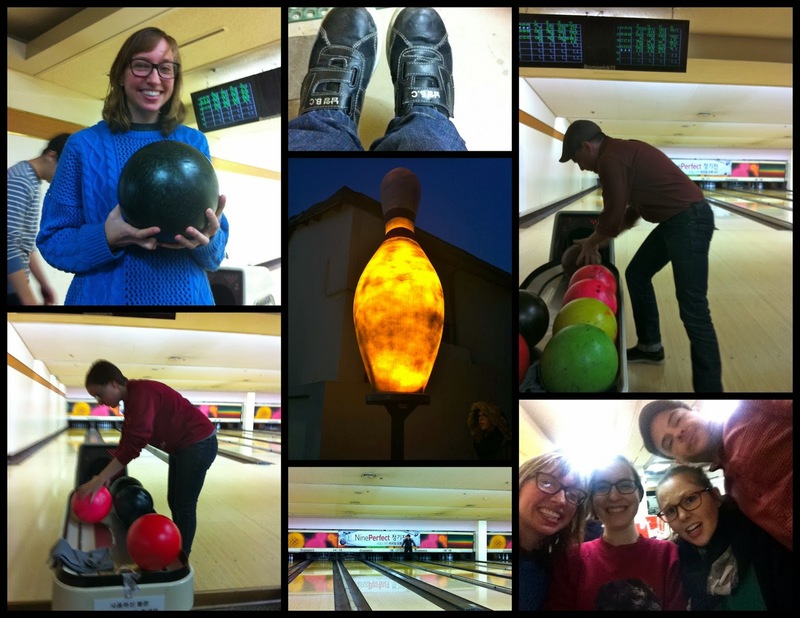 This evening I went bowling with some friends in Seoul, and it was a blast! Reminded me of all the times we'd go bowling in Madrid, and how that connected me to my midwest life. We didn't have an exact address for the bowling ally, but it was easy to find because there were giant lit-up bowling pins outside. Once we got there, I was worried we'd have to mess around trying to set up the score monitor in Korean, but that was not the case. The monitor just listed the four players as AAA, BBB, CCC, and DDD -- so we could start playing right away. I was CCC. We played two games. I don't remember my score from the first game, but I do from the second: 156! Directions: Take exit 7 and walk straight for about a block. Keep your eye open for the big bowling pin on your right -- that'll lead you right to the entrance. Tips: Know your Korean shoe size before you go! Here's a men's shoe size conversion chart (USA and Korea), and here's a women's shoe size conversion chart (USA and Korea). Also, fyi, no bumpers in Korea! But you don't need them, right? 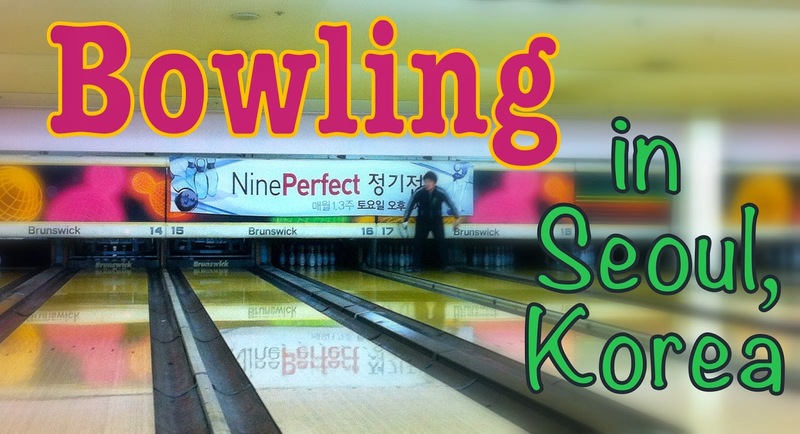 Here's a link to more bowling alleys in Seoul, though I'm under the impression that there are many, many more. 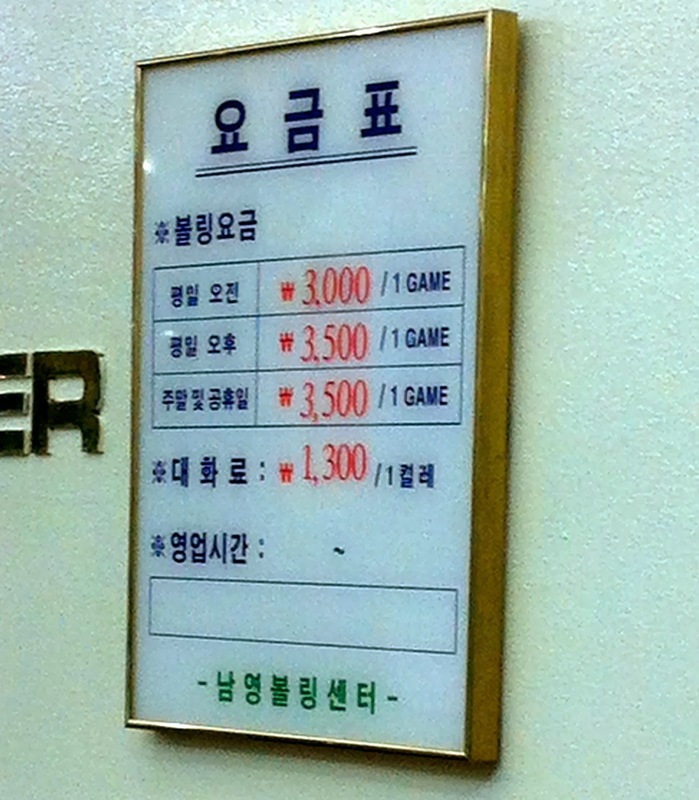 In fact, here's another list of bowling alleys in Seoul. My new year's resolutions always seem to be numerous, even though I know it's best to tackle just one thing at a time. But there's always so much I want to learn and get better at. If I only list three things, that means I won't do the other eight -- and I want to improve in those eight areas as well, I think. So in 2013 I had ten categories of resolutions, with many bullets under each. The results were subpar at best. I'm still working on the details for each, these are actually really poorly worded resolutions in their current state. The best goals are concrete and very specific. JJ and I are both dealing with different health issues. He's more knowledgeable in body health, whereas I'm better at mind health. We've decided to start a joint blog where we can document our journeys towards health. It will also serve as a resource for others, showing them that anyone can attain good health with small, simple steps (once we learn how ourselves!). We have a lot of work to do before it's up and running. Note: This goal should help with the first resolution. With the internet, it is now possible to work remotely. From your computer you can write and sell ebooks, edit, write copy, make podcasts, transcribe, be a virtual assistant, create apps, run a website/blog, or sell handmade items -- just to name a few options. With the influx of new opportunities thanks to new technologies, there's a whole new outlook on work. Spend time doing what you love doing. I want to avoid sitting in a desk from 9-5 (unless I absolutely love what I'm doing at that desk), so I'm looking at alternatives to the regular 40-hour week job. I'm excited at the prospects, but I know I've got lots of hard work to do. I really like how the three ended up being so intertwined; improvement in one should help the other two. Also, I've wanted to learn to code/program for a long time, but I've never made it a priority. I'm thrilled that it will be more of a focus this year, and anxious to see how much I can learn. I've also thought that learning Wordpress would be a good skill to have, but have been too stubborn to switch either of my blogs from Blogger to Wordpress. By creating this new health site in Wordpress I'll be forced to learn it, which I'm also pleased about. I'll be checking in here at the end of each month again this year, since that really helps to keep me on task. Have you made any resolutions for the new year? What do you think of my resolutions? Have any reading suggestions for me (website, blog, book, other)?